We are pleased to announce the inaugural publication of our research magazine "Tackling Global Issues." This magazine series focuses on research contributing to the resolution of global issues such as an aging society, environmental pollution and resource shortages. 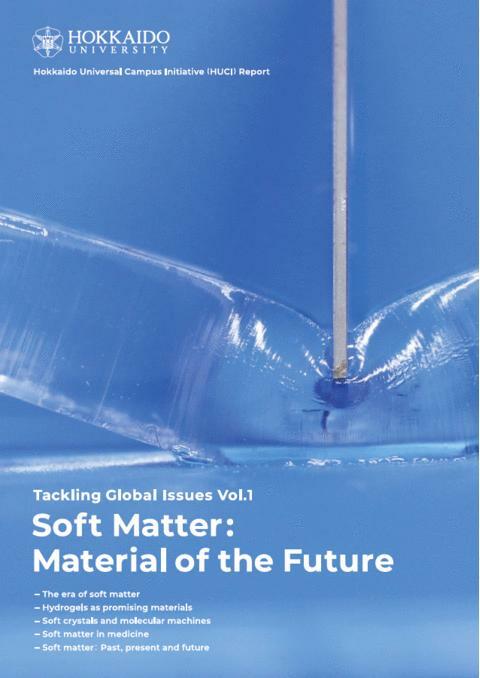 This first issue, published on March 23rd, 2018, spotlights the research field of soft matter, an interdisciplinary field attracting attention from chemists, physicists, biologists and engineers. We introduce 11 brilliant researchers who work on hydrogels, soft crystals and molecular machines, all of which are expected to be of great use in medicine and industry. It also includes a roundtable talk by globally prominent experts in soft matter science and 2 contributed articles. The magazine is available online on the Hokkaido University website and from the following URL. We hope the readers of this magazine will gain insight into how Hokkaido University is striving to solve global issues by promoting joint research that transcends the boundaries of nations and academic fields. Spearheading soft matter research is a mighty challenge, but scientists are striving for goals and innovation in this field. This magazine is issued as part of the Hokkaido Universal Campus Initiative (HUCI) which has been selected as one of Top Global University Project by the Ministry of Education, Culture, Sports, Science and Technology (MEXT) of Japan. Disaster relief: How can AI improve humanitarian assistance?